At Excel Consultant, our team of expert instructors and programmers helps businesses streamline their operations using Microsoft’s advanced tools. We are committed to working closely with you to ensure that we meet your company, organization, or institution’s distinctive needs. When we partner with you, we’ll begin with an on site discovery meeting. This involves visiting your office in-person to gain a better understanding of your current capabilities and workflow so that we can help you enhance your performance. 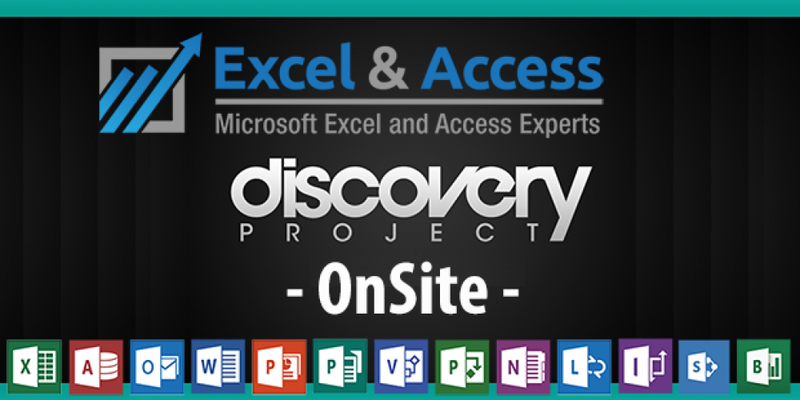 To learn more about our services or schedule an on site discovery meeting for your company, contact Excel Consultant today. What Happens During On Site Discovery? In this “war room”, we will collaborate with you to create an overview of what you are trying to achieve before breaking into smaller groups to find out more about your current available resources. Taking the time and effort to perform on site discovery provides numerous advantages. Fully understanding your needs improves the accuracy of our customized Microsoft solutions. These appointments also allow us to simplify and better tackle complex projects with multiple working parts. In addition, we use the information gathered during on site discovery to speed our delivery and clarify expected timeline, so you can keep billable hours in sight and in mind. We’ll set and meet intense “no fail,” hard-stop deadlines with complete co-operation and transparency. You can take a few simple steps to make the most of this initial meeting. First of all, a key requirement is having a central file-sharing system in place to house information related to the project. This can be a secure server or a cloud sharing program, such as a WAN (Wide Area Network) coupled with Microsoft Sharepoint software. You will also need to have the physical workstations you plan to use for the project set up so that our consultants can maximize on site time throughout the project. The final component needed for on site discovery is, of course, you! To facilitate the success of your project, you need to make sure everyone is present so we can properly assess all aspects of the project to arrive at the optimal solution. If you’ve been struggling with your workflow or simply want to enhance your operations, Excel Consultant can help.